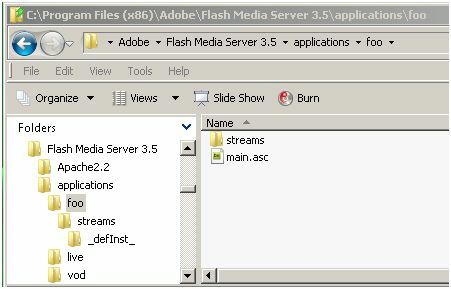 This article assumes that you have some knowledge of and access to an Adobe Flash Media Server as well as the free live encoder from Adobe called the Flash Media Live Encoder. 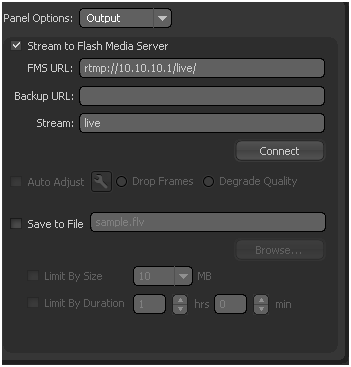 I wrote a simple custom pod that will allow you to stream high quality live video from the Flash Media Server to the free custom pod mentioned here that is being shared in a meeting room in Adobe Connect. For now the custom pod only supports live video not vod (file based video). 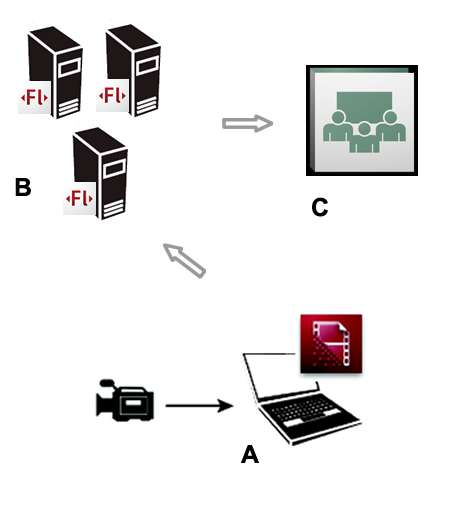 This approach does not nullify bandwidth requirements but it allows you to benefit from the capabilities that Flash Media Server provides around streaming high quality video. In other words if you stream a 2 Mpbs video to this custom pod hosted in a Connect meeting room the attendees of that meeting room will need more than 2Mbps to view it. The reason they will need more than the video requirement is that the Connect meeting room as a bandwidth requirement as well that needs to be taken into account. When you download the custom pod you will notice that it is just a Flash file (swf). This custom pod is provided free as is with no support. Open an Adobe Connect meeting room. Open a share pod if one is not already open and click the button labeled “Documents” from the popup menu select “Select from My Computer…”. Navigate to the custom pod (fmsVideo.swf) select and upload it to the meeting room. Notice the green dot in the upper left hand corner of the custom pod. That is used to open and close the settings. 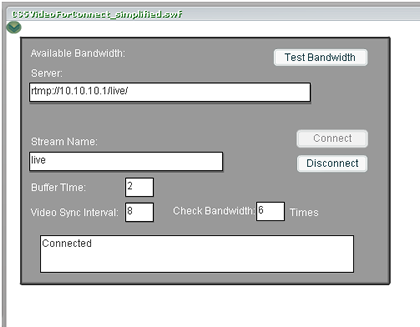 The setting will automatically close when the custom pod makes contact with a Flash Media Server. It also functions as a visual indicator of your connection state. Green indicates that you are connected and red indicates that you are not connected. The indicator does not change immediately when you connect or disconnect there may be a several second delay between changes in that indicator. 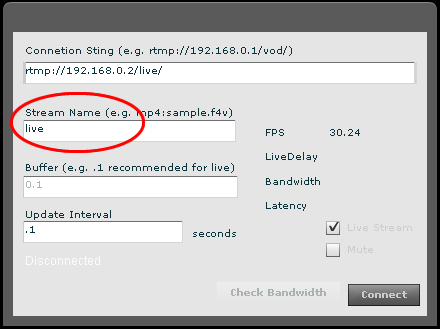 You will also notice in the preceding screen (custom pod) that only two elements are required in order to play the live stream ( server url starting with rtmp and the stream name). 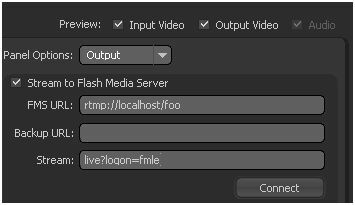 These elements correspond to settings in the Flash Media Live Encoder output panel. 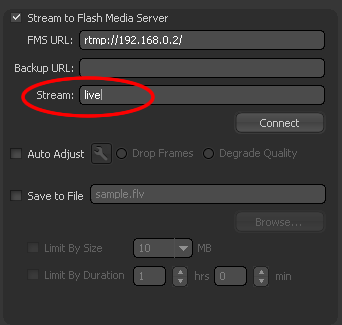 Once you have the stream published from Flash Media Live Encoder to the Flash Media Server simply copy and paste the FMS URL and Stream (name) from the Flash Media Live Encoder into the same fields in the custom pod and hit the connect button. That should do it. You can download the custom pod here.